It's hard to choose a favorite Easter candy. They're all just so festive and sweet! 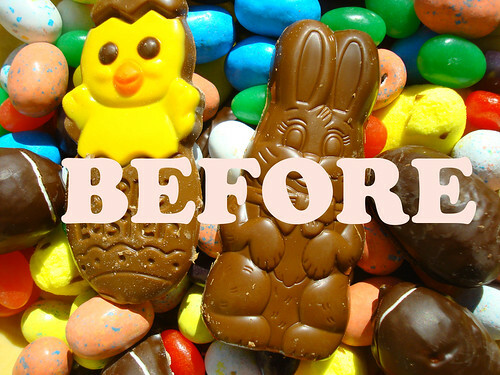 Bunnies made of chocolate, rainbow arrays of jelly beans, adorably speckled robin's eggs, pretty pastel Easter corn, and of course, Cadbury treats, both small (mini eggs!) and large (Cadbury Creme Eggs!). But instead of trying to pick a favorite, I decided this year that they're all good enough to share real estate in my mouth. 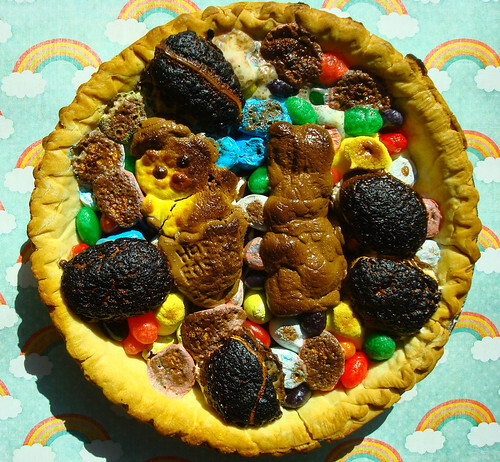 I did this, of course, by putting them ALL into an Easter Candy Pie. 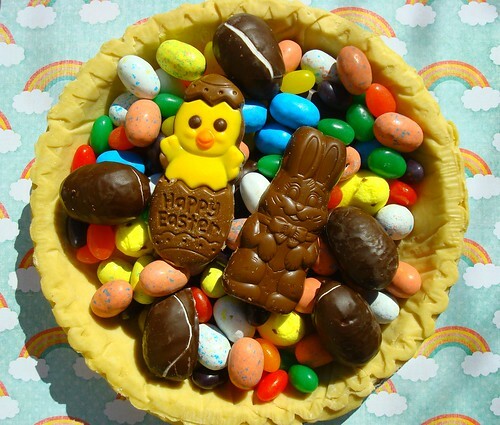 This may beg a simple question: What happens when you put all of your Easter candy in a pie shell and bake it up? I won't beat around the bush. Here's what happens. It's surprising that it took me so long to do this, what with the success I had doing something similar with Halloween candy. 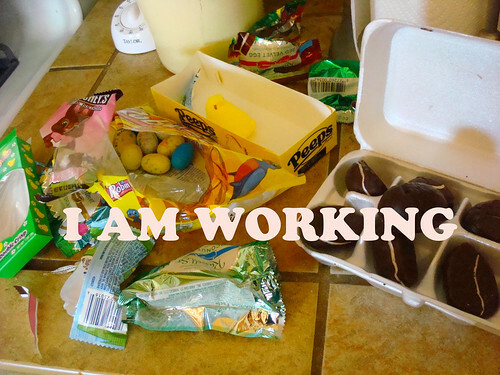 But seriously--Easter candy is so much more fun! So many more textures, flavors, and colors. 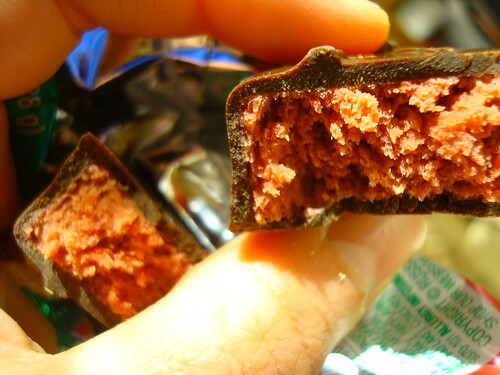 Plus (this is an aside) did you know that Russell Stover makes a Red Velvet chocolate covered Easter Egg candy? So monstrous when it all melts together. So fascinating to watch the festive candies melt and become gnarled and scary. 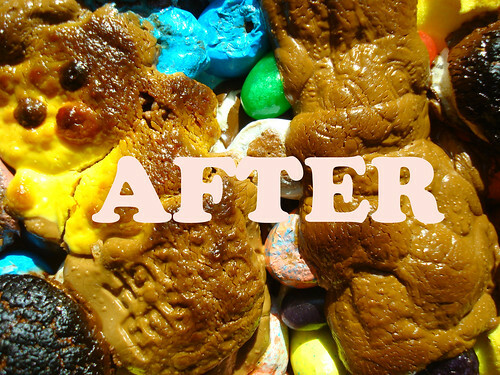 So gratifying to eat the gooey mound of what was once Easter candy. Together in your mouth, there is a beautiful fusion of sweet textures and tastes: jelly texture from the 'beans, toastiness from the scorched marhmallow chocolates. Is that a bit of coconut you taste, or shrapnel from the shell of a candy egg? Probably both, fused together with melty fondant from the nearby Cadbury creme egg. Friends, I realize that you might not want to take my word for it and might desire--nay, need--to try this for yourself. And in that case, I am happy to share my recipe with you. Serves between 1 and 8, depending on how hungry you are. 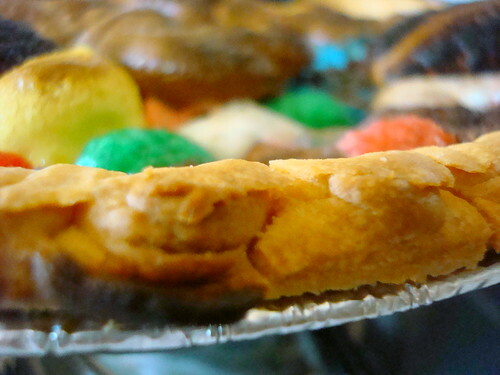 Take your unbaked pie shell and look at it for a moment. Are you sure you want to do this? Yes, you are. Fill the mofo with that Easter candy. You want it to be full, but level (don't get greedy and mound it above the top height of the pie crust. It will get messy). Bake at 400 degrees for oh, 20 to 30 minutes. 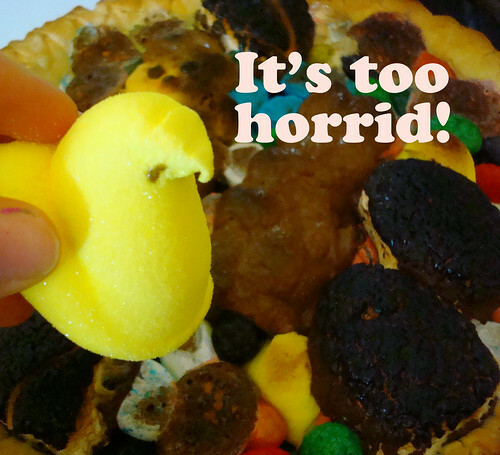 (Note: I did the Halloween candy pie at 350 degrees for 30-40 minutes. You could do that too, but I was hungry, so I did it this way this time. Don't judge me).